Washing & Grooming your dog is very important, it not only helps to prevent your dog from having skin irritations, smells, bacteria & illness but also makes your dog happy and healthy. To provide you with our services, all that is required is access to water and electricity. Yummy Doggy Treat to complete the experience and reward your dog for a job well done! All dogs, regardless of whether they have short or long hair, require regular brushing, as it not only removes dead hair, but ensures that your dog has a healthy coat. We usually use the FURminator tool whenever possible to achive this. The tool was designed to grab and remove - not cut, but remove - undercoat hair quickly and easily. This specialised tool does not hurt your pet and significantly reduces the amount of hair being shed by your dog. It’s important to have the dogs’ nails trimmed at regular intervals, as failure to do so will result in severe discomfort to the dog when walking and will end up requiring you to take the dog to the vet because of such issues as ingrown toe nails. We do trim the nails of all dog we wash if they allow us to do. In case they don,t let us do it and nails need to be trimmed, we will inform you to bring it to the vet. This is another important part of the procedure, as it gives the Groomer the opportunity to check for any possible ear infections, and other problems, and to remove dead hair. This includes a thorough bath using specialist dog shampoo and conditioner to suit your dogs skin and coat type. Your dog is then blow dried and has conditioner applied on the coat so that it stays looking and smelling nice for longer! Hydrobaths are used by many people around the world to clean their dogs. High pressure water is pumped through the hydrobath and onto your pet, penetrating through the dogs coat to where the dirt is. The pressure of the water in the hydrobath massages the dogs and removes dead skin, dirt and excess hair. It is often hard for owners to clean their dogs properly, whether they are a large dog that wont sit still, a Husky with a double coat that is too hard to wet, a small dog who has skin problems or an older dog with arthritis. Buddy's Mobile Dog Wash offers a professional hydrobath service that comes to you. We use fresh water for every dog and a wide selection of shampoos and rinses. Each dog is washed thoroughly, conditioned and rinsed. Most dogs enjoy this as it is an extra cuddle session for them. 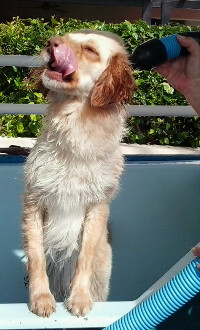 Nevertheless, it is an important step as it hepls the dog to relax and it drastically reduces the time for blow drying. Again, most dogs enjoy this procedure. However, we do NOT sedate dogs which are nervous. If your dog is extremely nervous of getting groomed, perhaps it might be worthwhile obtaining some rescue drops (available in the pharmacy), which you can give to the dog before the groom commences. It is best to get your dog used to the grooming process from a young age, as they are less likely to be so nervous when they get older. The final step in the grooming process, is to spray apply a little cologne to your dog’s coat. Cologne won’t be added, however, if your dog has skin allergies or sensitive skin. The dog is then returned to its owner, looking and smelling beautifully.